Here at the Pole, we celebrated Thanksgiving on Saturday. And by celebrate, I mean we got the day off from work and consequently, our first two-day weekend of the season. To celebrate, we had a big turkey dinner on Saturday night. But I’m not writing to tell you how amazing the food was, how interesting it was to see everyone dressed up (relatively speaking – these are people I normally see in heavy work overalls, huge jackets, and frost-covered face masks, neck gaiters and goggles). Nor is this about the dance party that ensued after I had a nice long sit watching a movie (because we can’t get any football games on TV). This is a story about the next day. The day I joined my first off-station Antarctic expedition. Many years ago, one of the transport aircraft had a bad day (crash landed on landing) here and couldn’t fly home. Instead of taking the time and effort to disassemble the aircraft and ship it, they just towed it beyond the end of the skiway and abandoned it. Now the aircraft is completely engulfed in snow. In fact, it’s so many feet under the surface that a long, deep tunnel is being dug to get to it. The rumor is you can get into the plane and walk around what is left of the cockpit and fuselage and tradition insists you sign your name inside to validate your visit. The club of airplane-signers may become very exclusive as the weight of the snow is starting to crush the aircraft. Some here are surprised the powers-that-be still even let folks dig down to the plane. Undaunted and feeling strong, four of us set off on skis from South Pole Station, got on the skiway and followed it to the end and beyond. Two of the members of our posse are from the southern US and for at least one of them this was a first time on skis. Our ski pole tips squeaked as we levered them across the hard snow. The sky was clear and the afternoon sun beat down and bounced back up, reflecting off the white ground. The wind was amazingly calm. It was almost eerie. The skiway provided a flat, even skiing suface perfect for out beginners. 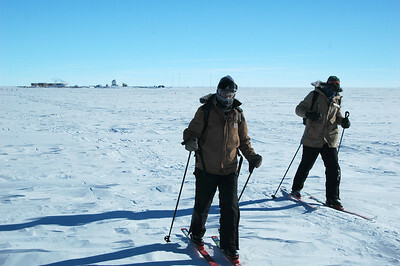 But once we got beyond the skiway, we were traversing wind-sculpted virgin Antarctic snow surface. After a few breaks we finally approached a mound in the snow. Two full sheets of plywood covered a hole perhaps a meter and a half wide and two meters deep. There, another wooden cover opened up to a small ladder that descended another two meters. At the bottom of this snowy pit was more snow just waiting to be dug out. A bucket and rope snow-removal system had been rigged up and a shovel waited inside for the next airplane hunter to come along and start digging. And so we did. We took turns climbing into the cavernous hole. One person would dig and fill the bucket and another would pull it up from the frozen well, dump the snow and lower the bucket back down. Looking back at the station from the aircraft site, it was now just a small bump on the horizon. The wind was blowing at a benign five knots, but once we stopped skiing, that was just enough to keep us chilled while we waited at the rim of the snow tunnel for our turn to dig. It wasn’t much warmer in the hole. In fact, it was colder. When I got my chance to descend, I was relieved to get out of the wind and start working to warm up. But it was like a dance to keep from chopping my toes off in the limited space. It’s hard to dig right where one stands. After filling a few buckets, I struck something hard. It was another plywood hatch. Maybe the last one covering the entrance to the plane. Suddenly, I realized how cold my toes were and I had to get out of the hole. My body was mostly active, but in that small hole my feet hardly moved at all. Back on the surface I started doing jumping jacks and swinging my feet while stabilizing myself with another shovel. It was a good thing I could still feel them. It’s when you can’t feel your extremities any more that you’ve got problems. Everybody got a turn digging and freezing and then it was time to go. It was Sunday night and we all had to work in the morning so we were interested in getting to bed. The constant sunlight, however, tries to fool you into staying out longer. We didn’t get the final hatch uncovered entirely, but being so close is enticement enough to ensure we’ll come back and finish the job. We skied back over the windswept landscape and the station grew bigger with every shush of our skis. By the time we glided in, we had missed dinner. But that’s what the leftovers fridge was for and on Thanksgiving Weekend there was plenty of great food to stuff us for our next trip… going to bed.